April has been a very busy month for me which is why I haven’t been posting very much. The good weather has me in the garden doing all kinds of chores and planting. I have to get so much done before the hot weather shows up, and believe me, the hot weather has already made brief appearances between cool fronts and will be here to stay in about three weeks. The middle of May is usually when the heat starts, and then it is good bye to cool weather until October. 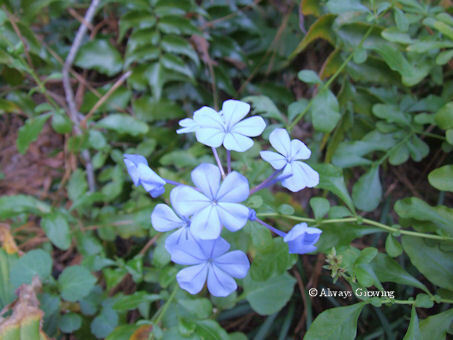 This month has been seen a bounty of flowering plants. I don’t know if I can remember them all, but I will try. 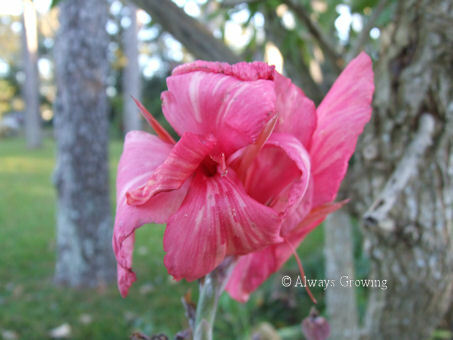 The amaryllis bulbs are blooming, but there are not as many flowers as usual. I think all that munching by the grasshoppers last summer on the leaves stopped many of the bulbs from developing flowers. 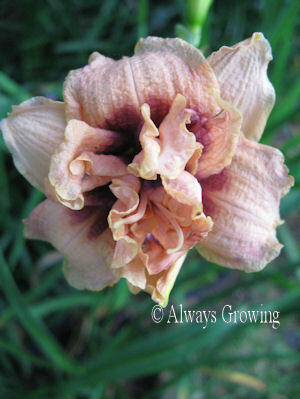 This is only one of the varieties blooming right now. I’ll have to post later about the others. 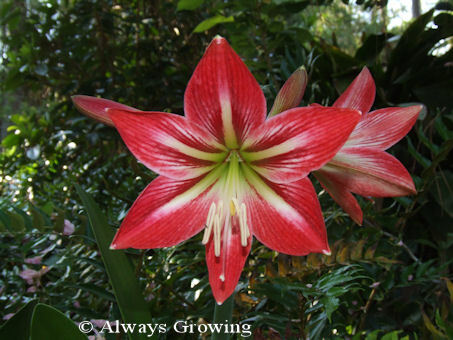 While Christmas time is when most people think of amaryllis, here in the Deep South, where they are planted in our gardens, spring is amaryllis time. 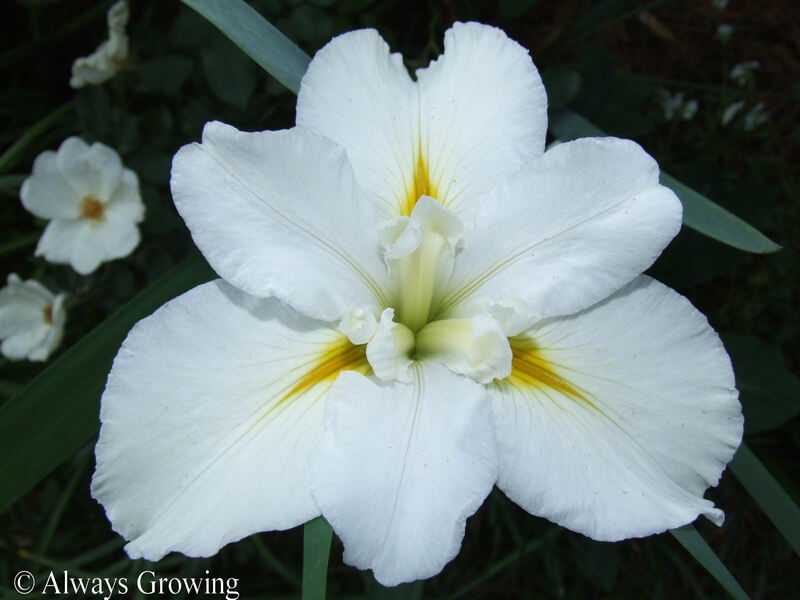 Also making a very nice showing are the Louisiana irises. Here, is one of my favorites, Marie Dolars. 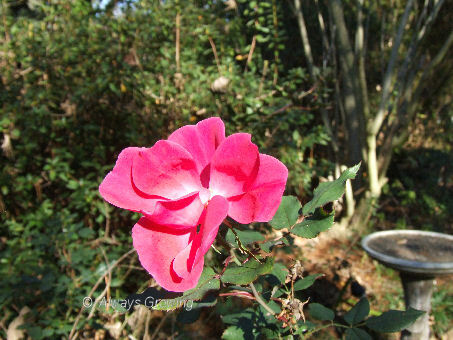 A few roses started blooming in late March, but all are blooming now. Mutabilis (Butterfly rose), Penny Marshall, a pink climber, Iceberg, Caldwell Pink, White Out and the Knockouts: red, pink, and blushing. 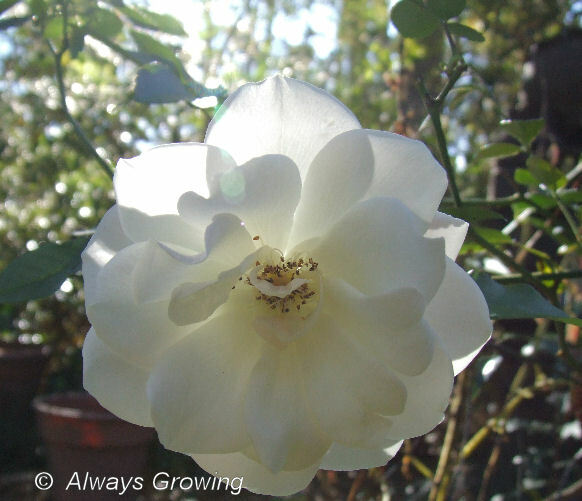 White Out is my newest rose, and it is doing so well. 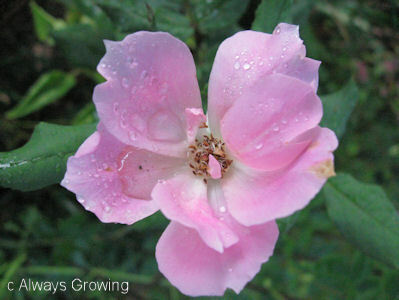 While not a Knockout, it was developed by the same company as the Knockout roses and seems to have all the good qualities of the Knockouts. 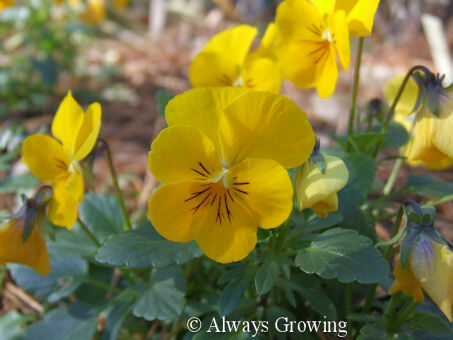 It has been doing very well here even with our high humidty – no blackspot so far and tons of flowers. 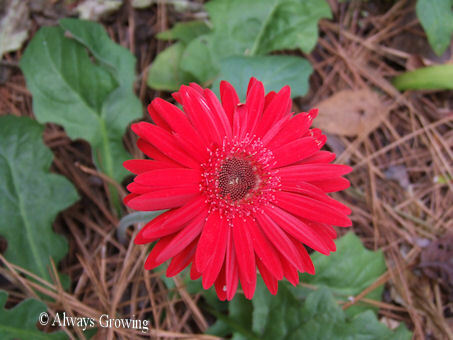 The gerbera daisies have done so well this spring, that I bought more of them last Saturday. This is the best they have bloomed since I planted them three years ago. I guess they are finally a good size. Three of the plants have put out twelve to fourteen flowers at a time. I can’t wait for the other gerbera daisies to get as big as these. 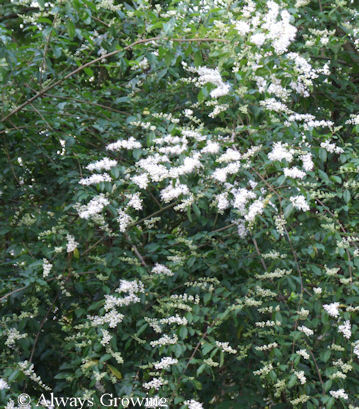 The wild privet is blooming and perfuming the back garden. This bush is really in my neighbor’s yard, but it is drapping over her fence into our property. 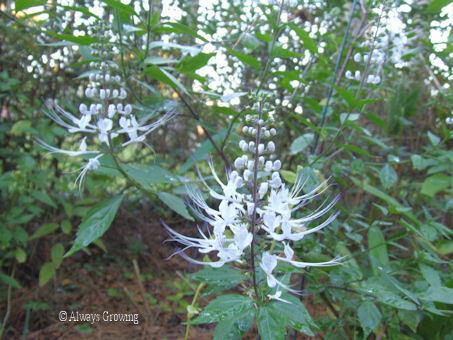 It is lovely at this time of year, but this is a highly invasive plant, and I spend a good deal of my time pulling its thousand of seedlings that show up all over the place. 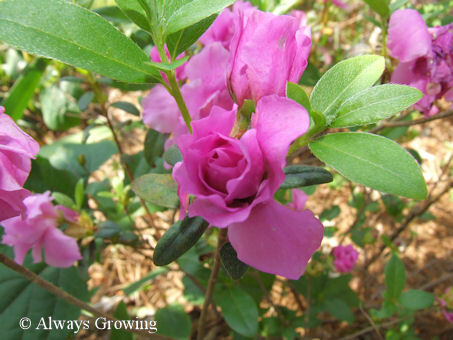 Most of the azaleas have finished blooming by this month, but the rosebud azaleas are still going strong. 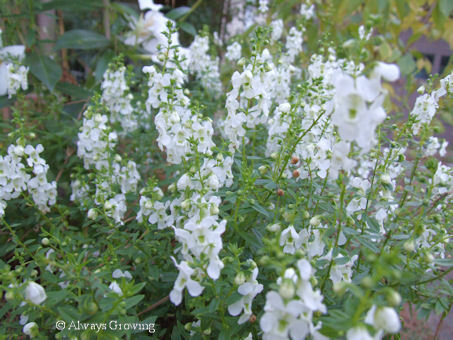 Snapdragons and violas are still blooming and should continue through May. 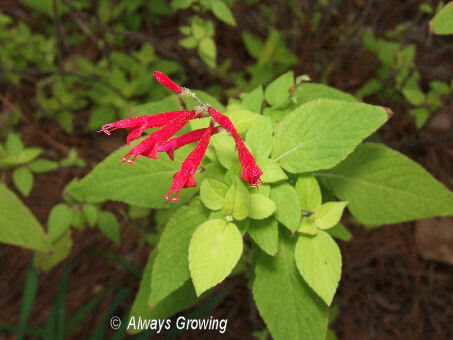 Other flowers in the garden on this 15th of April are the salvias, jasmines – yellow and star, even a volunteer impatiens or two, and the first daylily bloomed today. 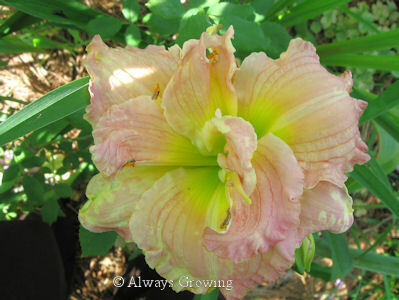 Old reliable Stella d’Oro showed up just in time for Bloom Day. 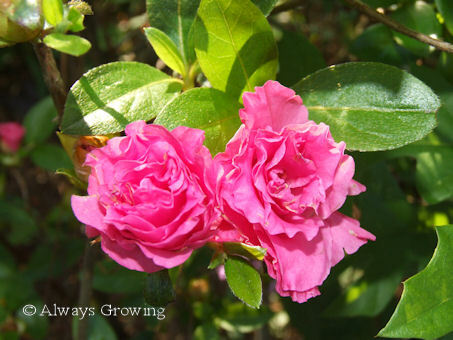 More flowers are showing up this month, but even more are showing signs of getting ready to bloom in the next week or so. The ornamental pear tree (Cleveland Select) started blooming a while back, but it still has flowers opening up. 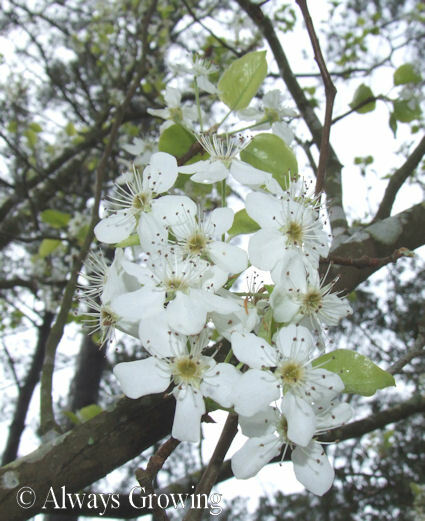 Our Bartlett pear tree is also blooming with flowers that look almost identical to the ornamental pear’s flowers shown above. 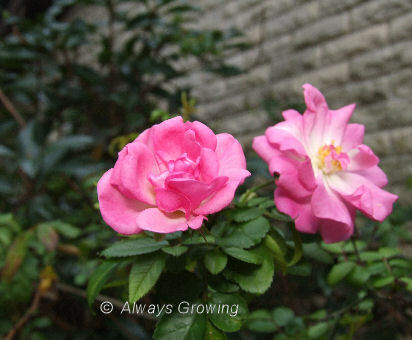 The roses have also started showing a few blooms with many buds promising more flowers in about a week or so. 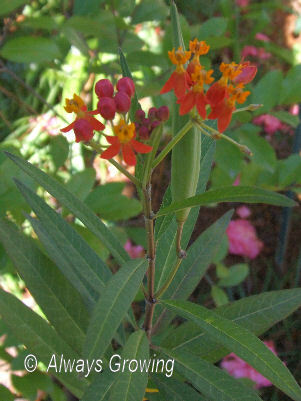 The Butterfly Rose (Mutabillis) has just started blooming. 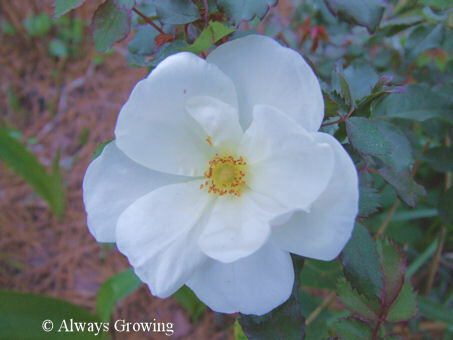 The Knockouts (Red, Pink, and Blushing) have shown one or two flowers, and White Out, a rose very similar to the Knockouts, has really started blooming. Our citrus trees are in flower and these blossoms along with the Bufford hollies, are perfuming the whole back yard. The satsumas and lime flowers look the same. Here are the lime tree’s. 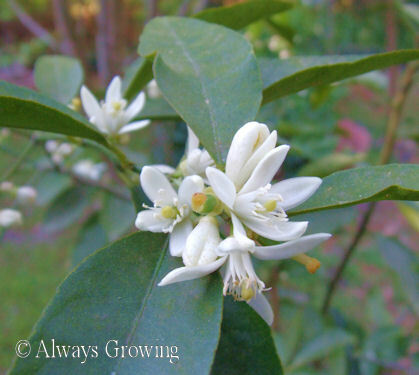 When you smell these flowers, it becomes apparent why orange blossoms were so popular as wedding flowers years ago. 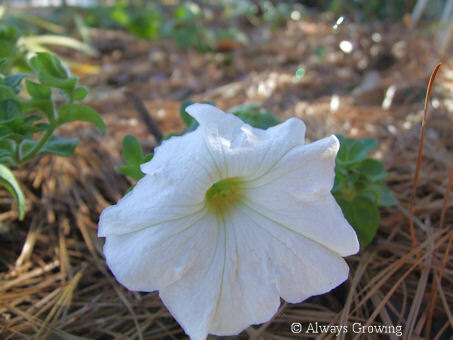 The white petunias, that I planted last fall, have started blooming profusely since the weather has warmed up. The white petunias make a good combination with the red gerbera daisies. 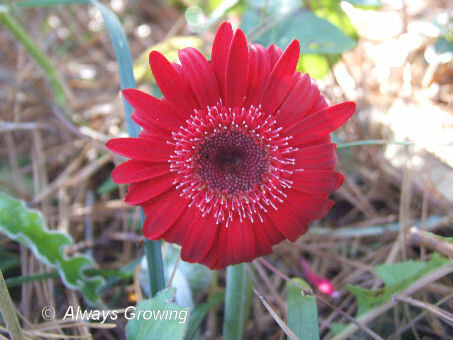 These gerbera daisies have been in my garden for about three years now, and this is the most blooms I have ever gotten. 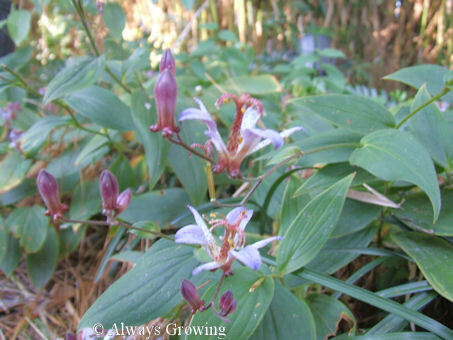 Most of the plants are putting out five to six flowers with more buds waiting at the base of the plants. I was afraid the cold would damage or kill them, but they do not seem to be fazed by the winter cold we had. 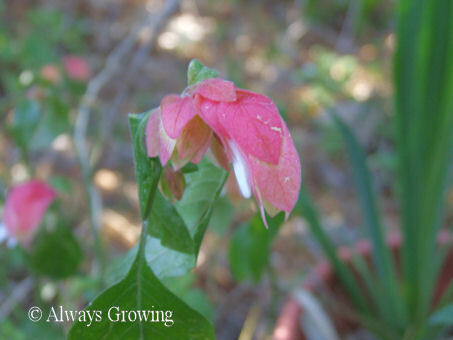 The shrimp plant that overwinters every year is flowering. It always amazes me that this plant survives freezing temperatures. I just never considered this a hardy plant at all, but it is for me. 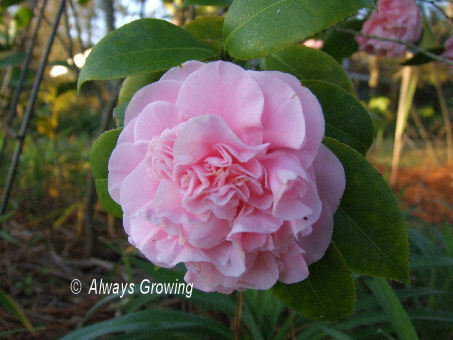 The last of the camellias are hanging on, just as the first of the azaleas are showing up. 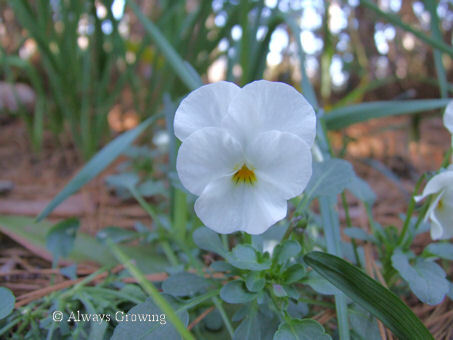 The flowers I have written about recently that are still blooming are the summer snowflakes, violas, calla lilies, lorepetelum, and a few tete-a-tete daffodils. This month certainly seems to be kicking off the spring flowering that reaches a peak around here in April and May. 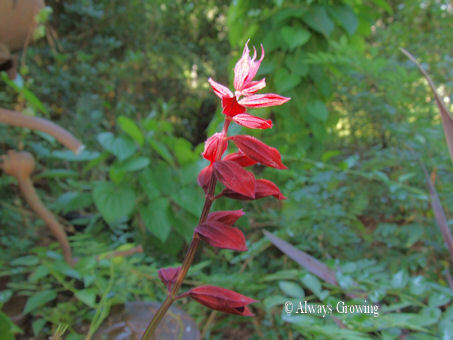 Be sure to see what is blooming in other gardens by clicking on the link at the beginning of this post. Well, probably like most of the gardeners in the Northern Hemisphere, I do not have too may flowers to show for this January. 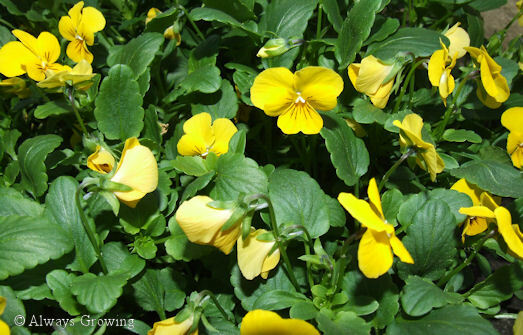 Thank goodness for the violas and camellias. 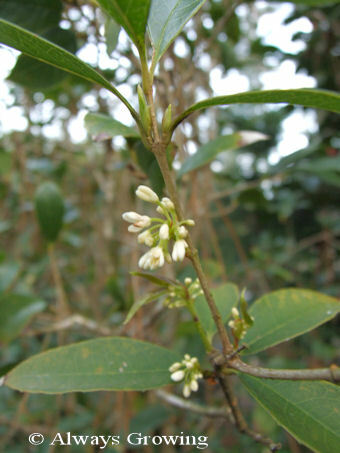 The sweet olive is blooming and sending its lovely aroma all around the patio. It always amazes me how such a small flower can send its scent over such a large area. 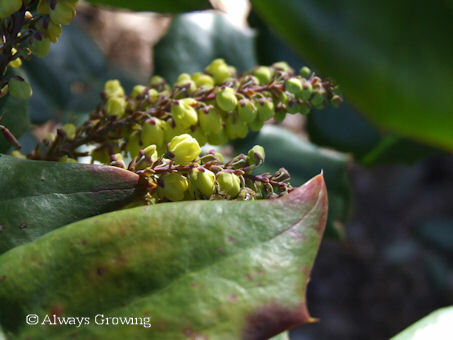 The grape mahonia is blooming, and, in fact, I even saw two bumble bees feasting on its flowers. 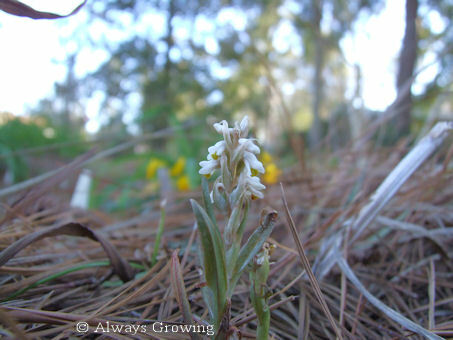 Finally, a few little soldier orchids have popped up in the circle garden. 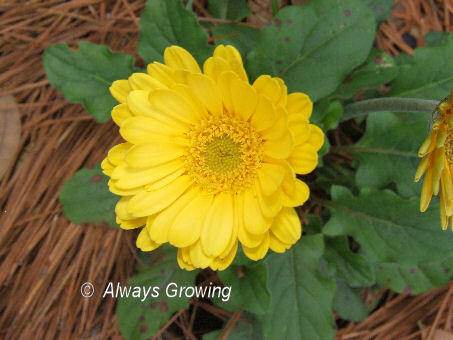 Usually, they show up in the lawn, but at last a few have shown up in the flower bed. While they are only about three inches high and are not that noticeable, I think they are cute additions to the late winter scene. 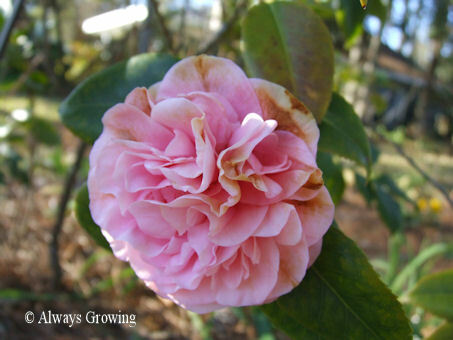 This February has a lot fewer flowers than in previous years. I have a feeling that everything will start blooming all at once instead of over a few weeks. Thanks to Carol of May Dreams Gardens for coming up with GBBD. This is the day (15th of the month) in which we post everything which is blooming in our gardens. I can hardly believe that January is half over. Where is the time going? 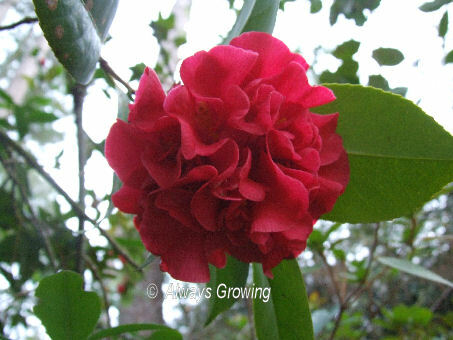 With the recent cold weather, there are not too many blooms to talk about this January. 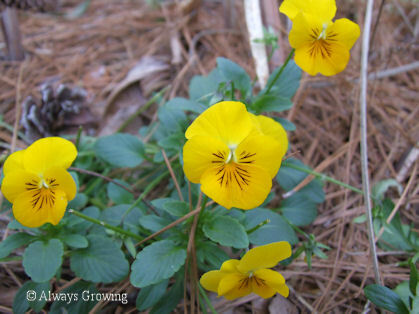 The violas are blooming even through the cold weather. Yellow, white, and orange ones certainly cheer up the cold. 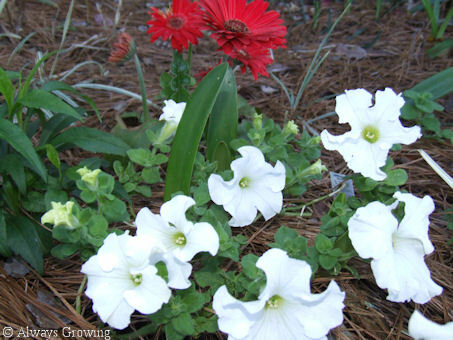 The white petunias I planted in November are growing, but there are few flowers. Come spring, there should be tons. Even though the flowers are sparse, they still brighten up a dreary day. 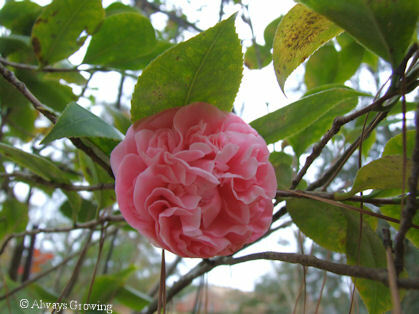 The camellias are blooming, but the open flowers were damaged by the cold, however, from a distance, this can’t be noticed. 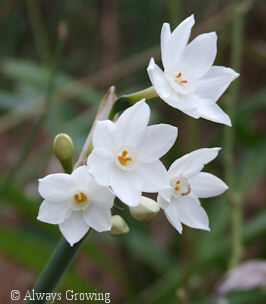 The paperwhites are still blooming, and the small narcissus has just started. None of these flowers were fazed by the cold temperatures. 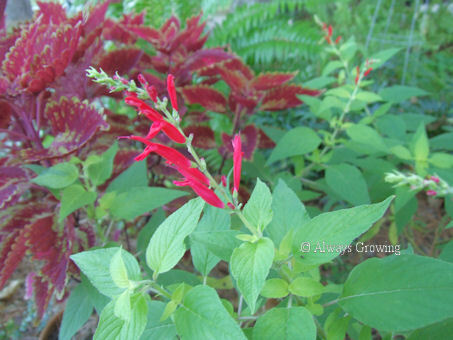 The only other plant, that I didn’t take a photo of, that is still blooming is the pineapple sage, Golden Delicious. Some of the plant was nipped back, but there are still flowers on the undamaged sections. I saw a hummingbird visiting the flowers about ten days ago; I wonder if it is still around. 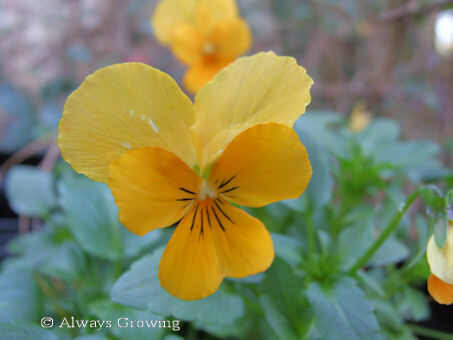 Warmer temperatures are on the way, so hopefully, February will bring more color to the garden. 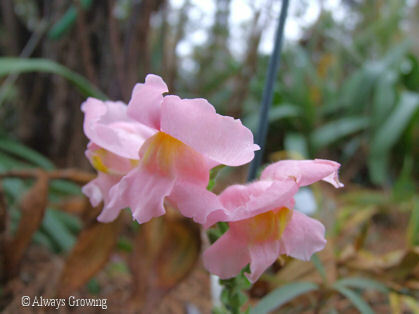 While there are flowers in the garden, even after all the cold weather we have been having, they are not very abundant. 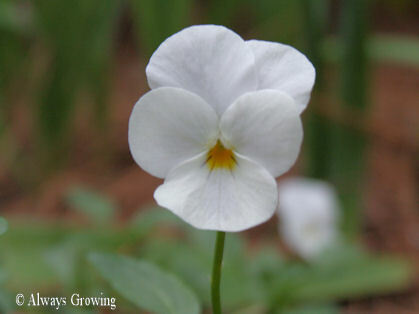 Except for the violas, a flower here or there is the norm. 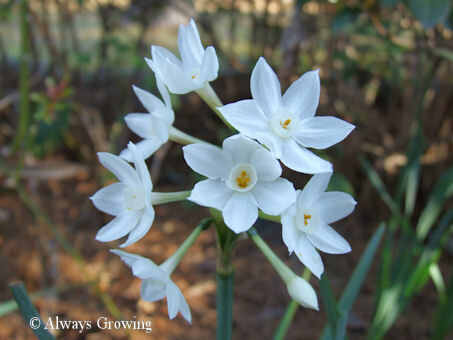 One of the new flowers to start showing up this month is the paperwhite narcissus. They seemed to have arrived with the cold weather. 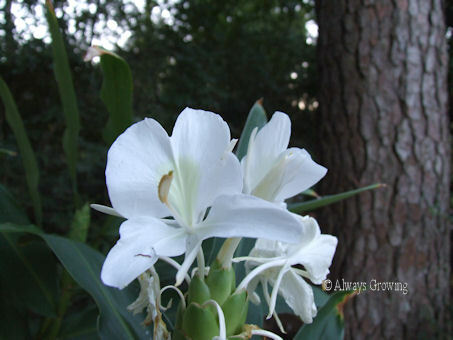 These are growing in the garden and are one of the few reliably bulbs that will repeatedly bloom this far south. 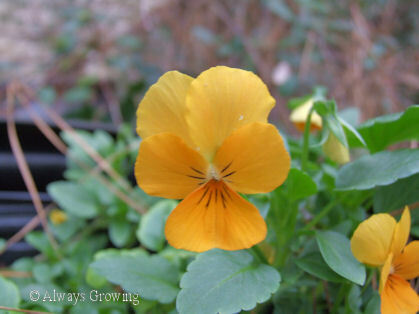 Speaking of violas, all are blooming. I have planted each color in a different area of the garden. The yellow are in the circle garden, the white are in an area that I have dedicated to my dad that is planted all in white flowers, and the gold violas are in pots by the entry. 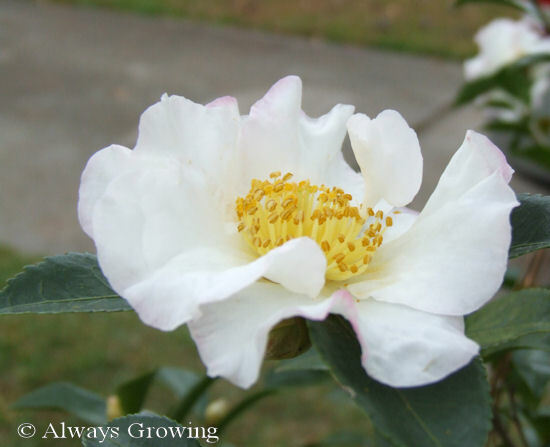 Camellia sasanquas, both the seasonally appropriate Yuletide and the white Setsugekka, are still blooming. 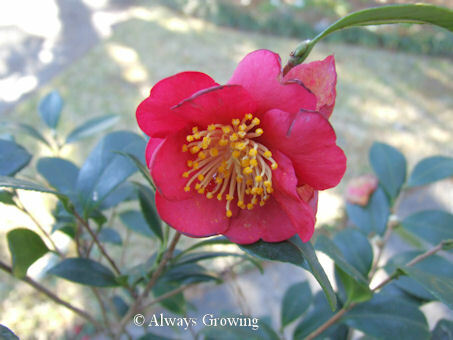 Debutant, a camellia japonica, has flowers that I just noticed today. 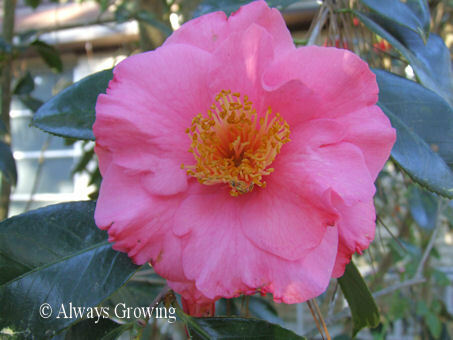 This is one of my favorite camellias because of its peony type bloom. The sages are still blooming. 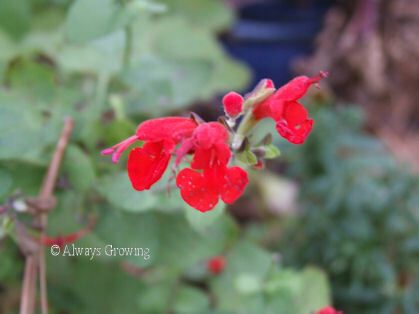 Sages with flowers this December are the pineapple sage and Lady in Red sage. Again, these are very appropriate seasonally colored flowers. 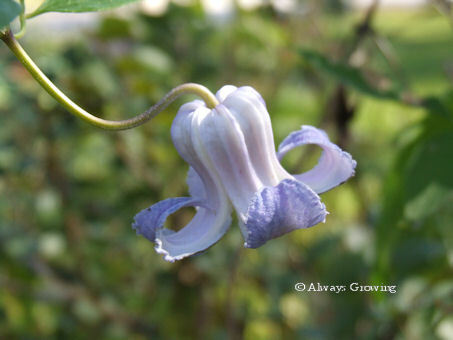 Even the Bleeding Heart vine still has a few flowers. 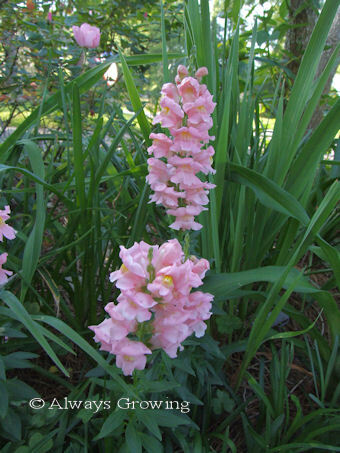 And, finally, there is one little snapdragon that has a few flowers. As I stated before, most of these plants have just a few flowers this December, not the profusion of flowers that warmer weather allows. But all and all, not too bad for a month that has had colder than normal temperatures. Thanks to Carol of May Dreams Gardens for coming up with GBBD. 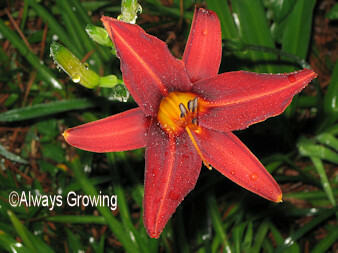 This is the day (15th of the month) in which we post everything which is blooming in our gardens. I can’t believe it is already November and that it is half over. Where has the year gone? 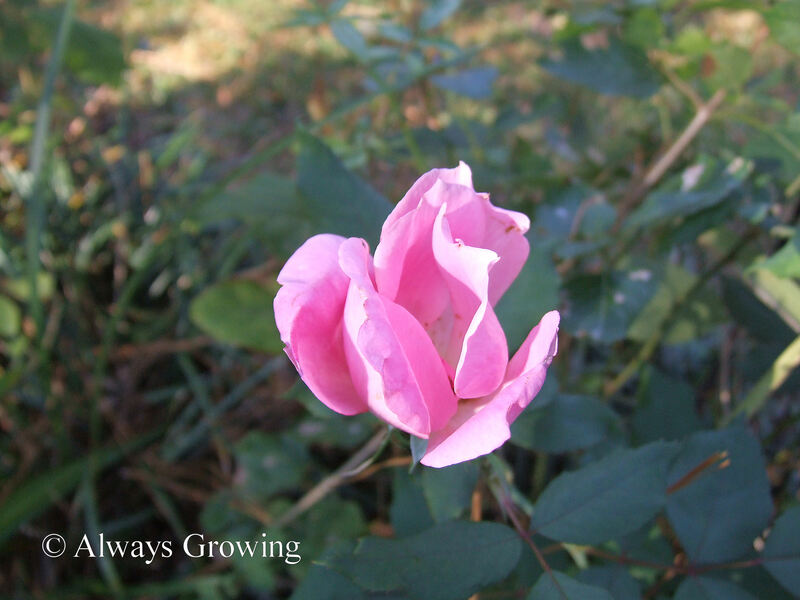 Even though it is mid-November, there still are blooms in the garden. 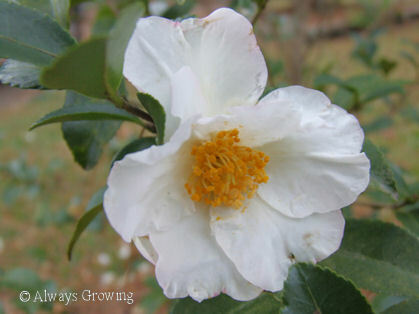 Some of the new flowers showing up this month are the sasanquas, Confederate rose, and cassia. 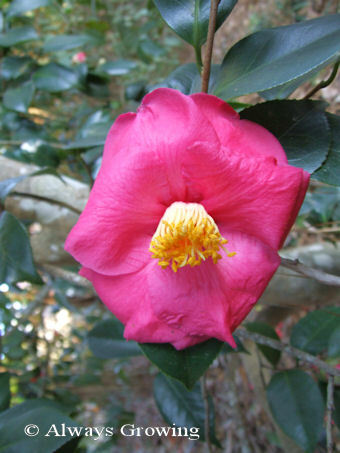 The sasanquas camellia that is blooming now is Setsugekka. It has been in the garden about three years. 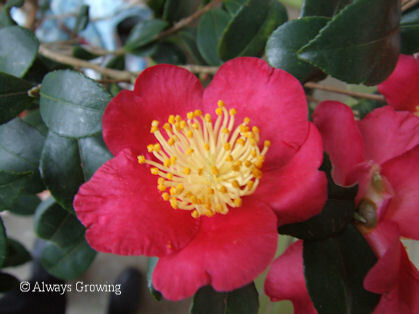 Yuletide, a lovely red sasanqua, has buds and one half-opened flower that I noticed this afternoon as I passed it by as I dodged the rain. 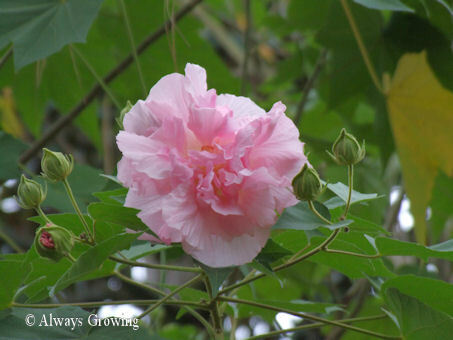 Another sasanqua that is blooming is Cotton Candy. Does it count if I just bought it Saturday and isn’t planted yet? Both the pink and the white Confederate roses are blooming. 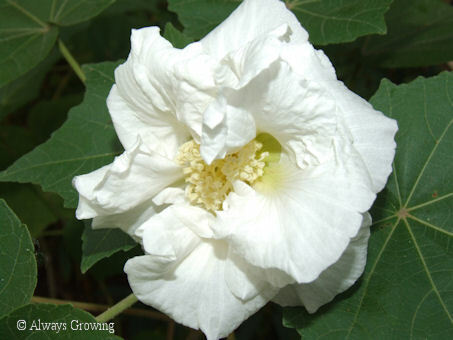 These are perennial hibiscuses and are commonly called Confederate rose or cotton rose. 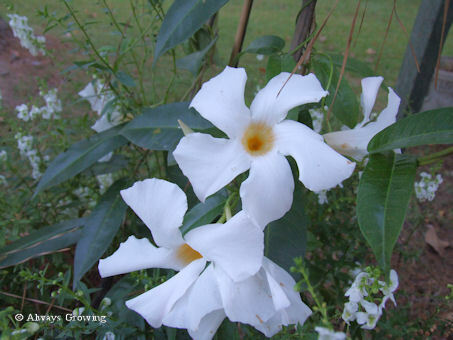 Whatever the name, these are lovely flowers to have blooming in autumn. 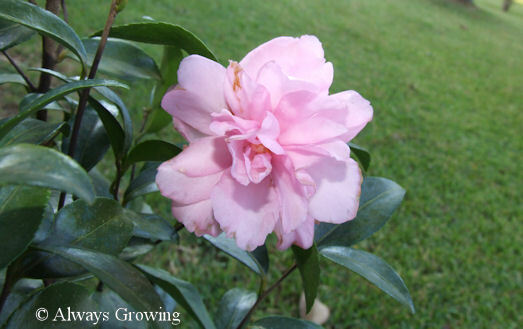 Both of these flowers will gradually change to a dark pink as the day progresses. 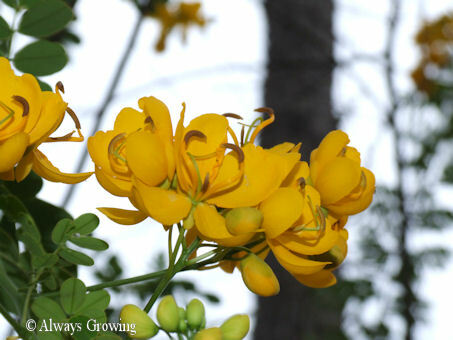 The cassia tree is another late season flowering shrub that is brightening up the last few cloudy days. 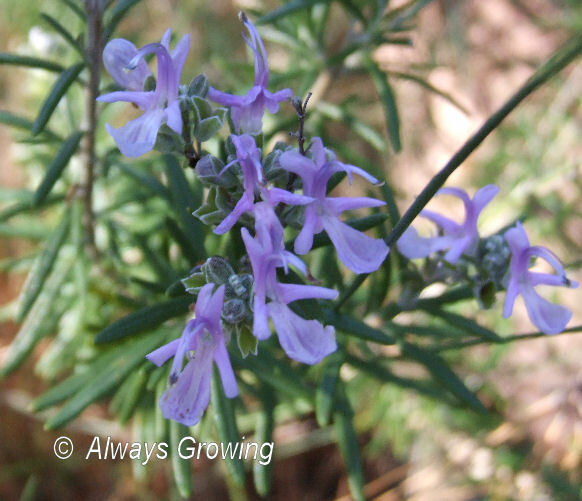 There are several flowering plants that have started blooming again now that the cooler weather has set in. 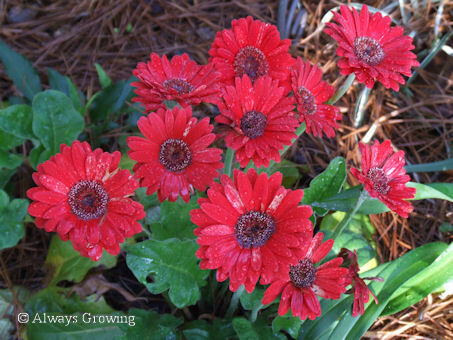 The gerbera daisies are one of these. The toadlilies are still blooming and making the shady area on the side of the house lovely. 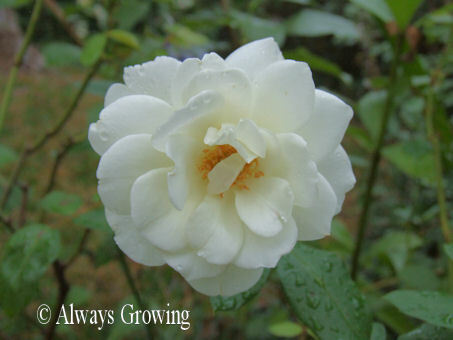 The cooler weather has also brought out the roses especially the white Iceberg and the Knockouts. 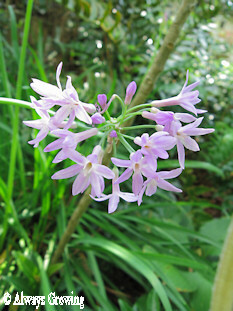 Many plants are continuing to bloom as they did in the summer. 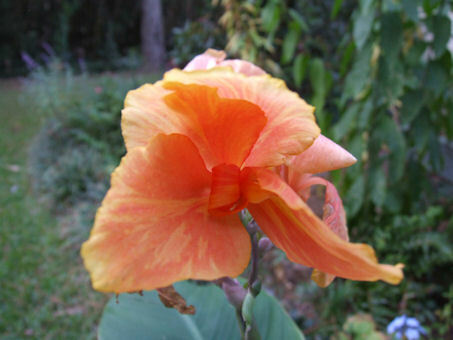 Those still blooming are the hibiscus, cat’s whiskers, salvias, impatiens, and even some gingers. I know I have probably forgotten some flowers that are still hanging on, but this is all I can think of right now. Too bad it rained today, usually I can go outside and look around to refresh my memory. 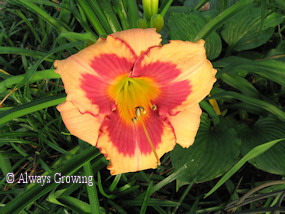 Be sure and check out May Dreams Garden to see what is blooming for other gardeners. Thanks to Carol of May Dreams Gardens for coming up with GBBD. 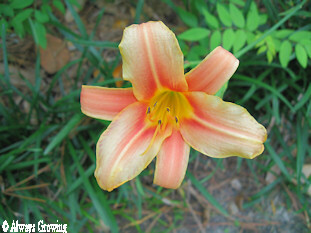 This is the day (15th of the month) in which we post everything which is blooming in our gardens. 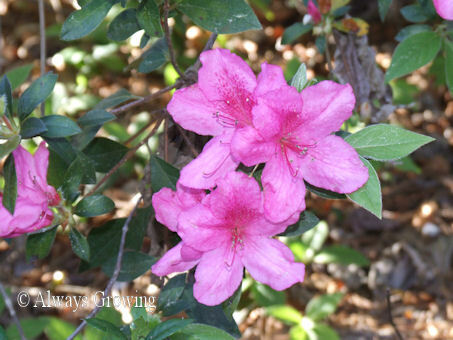 I didn’t think that there were many blooms in my garden this month, but I was mistaken. Once I was out and photographing, I was pleasantly surprised by the number of blooms. 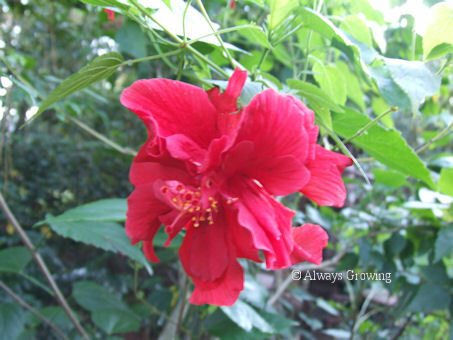 There still are many tropicals blooming, such as the hibiscus and gingers, but the cold weather that is just around the corner will stop this. 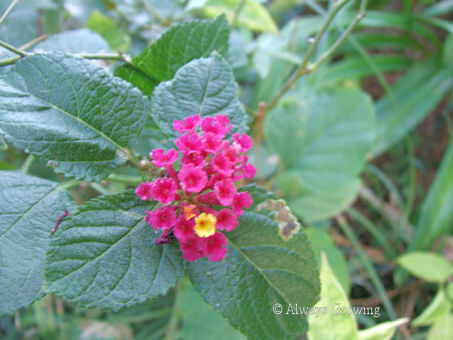 Some other warm season flowers still showing up is the Angelonia, Mandevilla vine, plumbago, impatiens, and lantana. 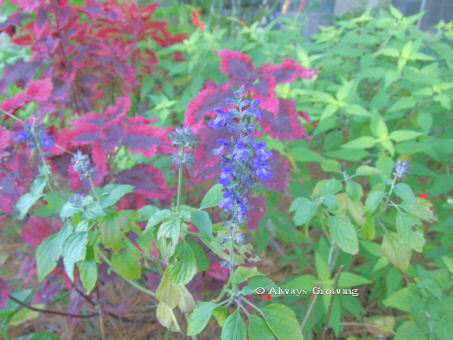 Some fall bloomers joining the toad lilies and sedums are the Mexican Bush Sage, pineapple sage, and vanhoutte sage. 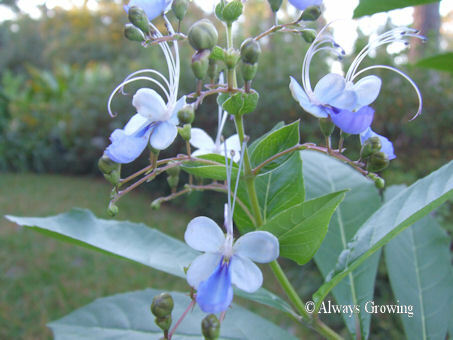 Miscellaneous plants blooming are the clematis crispa, Mystic Spires sage, Cat’s Whiskers, Blue Butterfly bush, roses, four o’clocks, weeping mary, and even the lorepetulum is starting to bloom again. I think there are more flowers in the garden now then when it was summer. 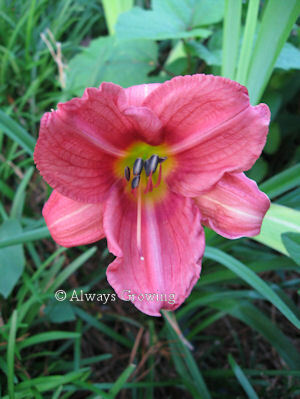 It is wonderful what a few weeks of cool weather will do to promote blooming late in the year. Here in South Louisiana, July’s heat has really ramped up. Right now, just after 7 PM, it is still 90 degrees with a heat index of 109. 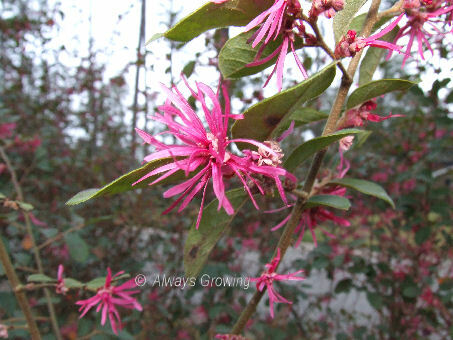 Is it any wonder that finding blooming plants right now is a challenge? Still, there are a few stalwarts out in the garden braving this heat. 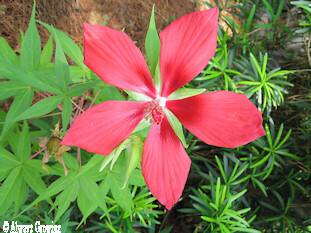 Texas Star (Hibiscus coccineus) is blooming in this heat. 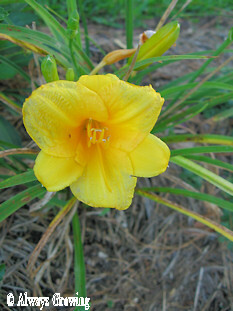 Daylilies are still putting out the occasional flower with the peak bloom period over by now. 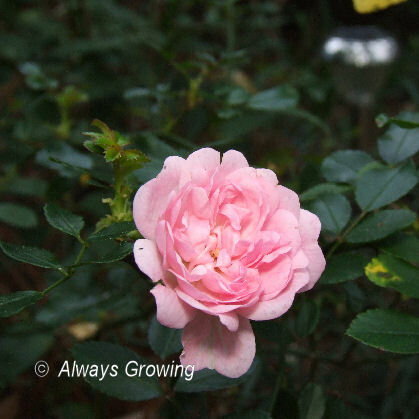 A few roses are blooming, but they won’t start blooming profusely again until cooler weather comes back. 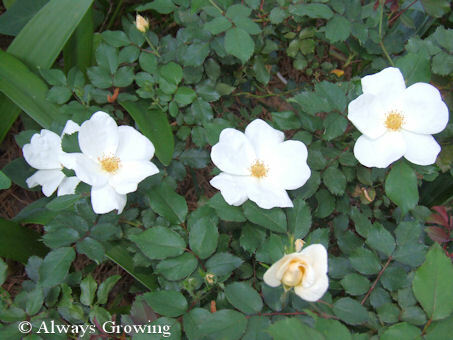 Blushing Knockout has blooms, and Iceberg, a white, is blooming. The society garlic has started showing flowers. 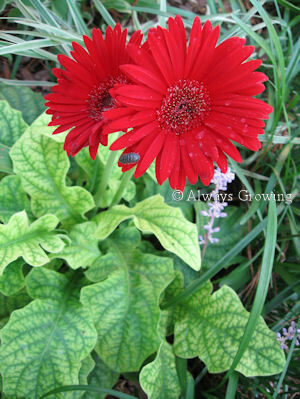 Red flowers blooming right now are the gerbera daisies, red ruellea, and lady in red salvia. 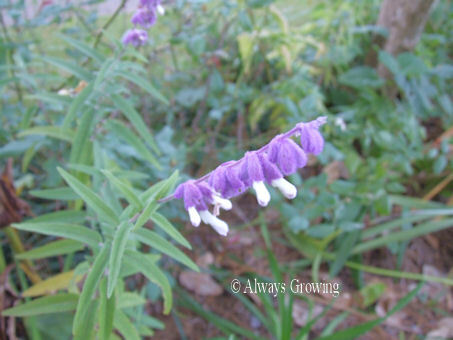 Speaking of salvias, the black and blue and mystic spires are also flowering well this month. While we are baking here and some flowers are still showing up, the cooler temperatures of October should bring more flowers, and I can’t wait for that month’s GBBD. 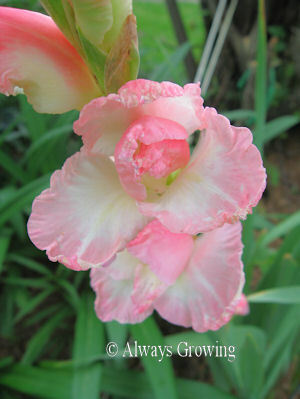 Be sure and check out May Dreams Garden for gardens that may have more blooms this month than mine does. Thanks to Carol of May Dreams Gardens for coming up with GBBD. This is the day (15th of the month) in which we post everything which is blooming in our gardens. 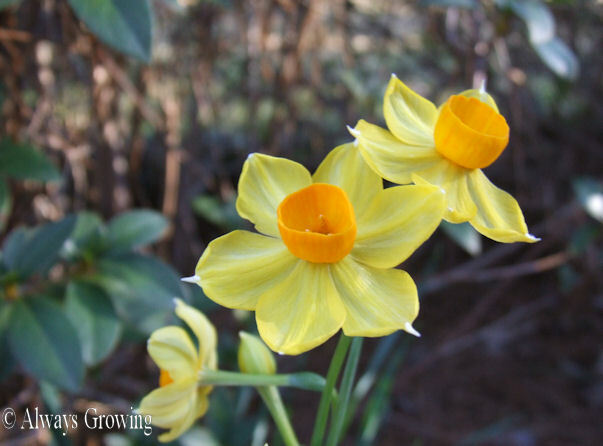 This is an easy way to keep a record of what is blooming in our gardens each month. 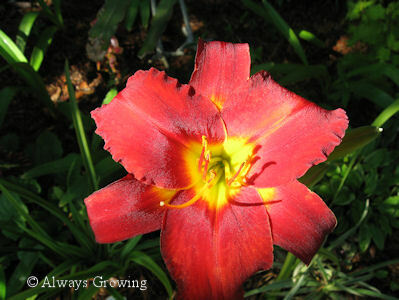 The daylilies are the ones doing the most blooming this month. Even the ones most recently planted have shown their lovely flowers. 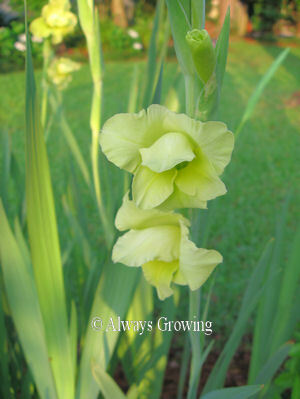 The lavender gladiolus have finished blooming, but the yellow ones and Friendship, a pink variety are still blooming. 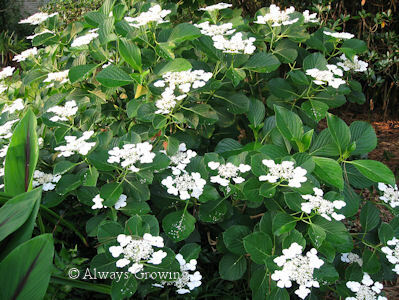 The hydrangea are still going strong – both the mopheads and the lacecaps. 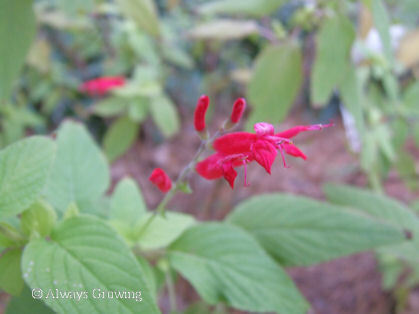 Salvias, hibiscus, roses, asters, rain lilies, night-blooming cereus, and crybaby tree, flowering plants that I have recently written about, are all continuing to bloom. All and all, this has been a very good month for flowers. 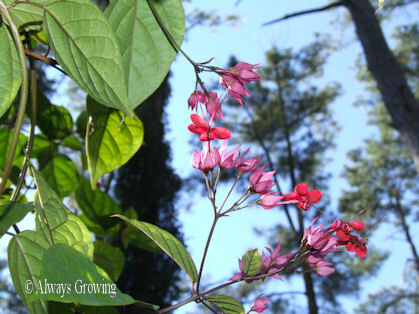 Be sure to visit May Dreams Gardens to see what flowers other gardeners are enjoying this month.